The Les Paul is one of the most world-renowned guitar models. It was originally made by Gibson guitars; however, after taking over the Epiphone brand in 1957, there is now also a less expensive version of this iconic guitar. 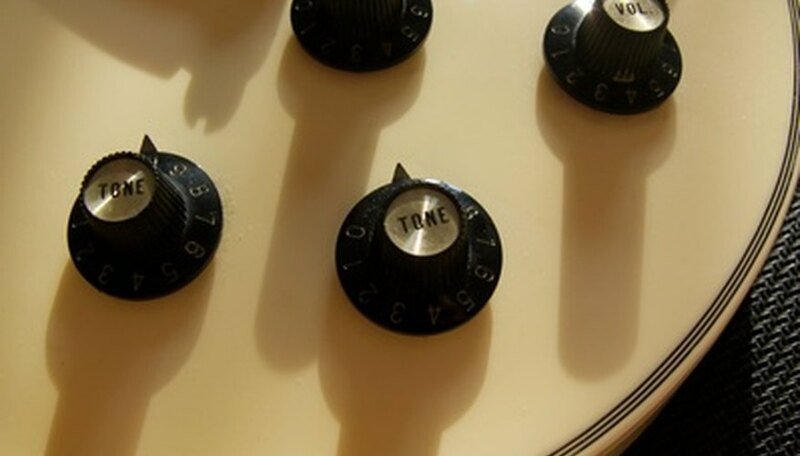 Although these guitars are known for their high-quality parts and craftsmanship, players may one day need to update or replace some of the components, such as the volume or tone pots that are wired into the guitar. Unlike other guitar models, these components can be replaced rather easily, without having to remove the guitar's strings or pickups. Remove the volume knob cover from the front of of the Les Paul. This knob will need to be removed in order to pull the volume pot through the back of the guitar. The knob is not fixed to anything and can be removed by simply pulling it straight up off of the cylinder that it rests over. Flip the guitar over and remove the diamond-shaped cover that conceals the guitar's internal wiring by unscrewing the screws that hold it in place. The guitar will have two back panels: one is diamond-shaped, and the other is a small circular cover located at the bottom right corner of the guitar. However, you only need to concern yourself with the diamond-shaped panel for the volume pot replacement. Locate the volume pot once you have removed the cover. There will be four different circular pots inside the wiring housing of the guitar. The top two are the volume pots, and the bottom two are the tone pots. It is important to know which volume pot you are going to change, as you might not need to replace both. The top right pot is the volume for the neck (top) pickup, and the top left pot is the volume for the bridge (bottom) pickup. Once you know which volume pot you are replacing, you will need to unscrew it, as the pots are bolted to the guitar's body. Remove the wires that are connected to the volume pot you are replacing. To do this, touch the connection points of the wires with your soldering iron; this will allow the wirers to be lifted free from their old connection point. Make sure you have made a note of where each wire is connected to the volume pot so that you may reconnect them correctly to the new pot. Solder the wires to the new volume pot as you noted in Step 4. To do this, attach the wire to the connection point and solder it together. After doing so, reattach the volume pot to the guitar body and look to make sure that you did not accidentally remove any of the other wires in the housing before you reinsert the diamond-shaped cover. Screw the cover back over the wiring housing in the back of the guitar. Slide the volume knob you removed from the front of the guitar in Step 1 back down on the exposed metal cylinder protruding from the guitar.